Plywood is wood veneers bonded together to produce a flat sheet. An extremely versatile product, plywood is used for a wide range of structural, interior and exterior applications - from formwork through to internal paneling. Plywood is an assemblage of wood veneers bonded together to produce a flat sheet. While it can be tailored to suit an extensive range of applications, the normal product consists of at least 3 plies, with the grain in the alternate plies running at right angles. Plywood offers all the inherent advantages of the parent wood plus enhanced properties in its laminated structure. Being a wood based material, plywood has the ability to accommodate the occasional short-term overload; up to twice the design load. This is useful where seismic activity or cyclonic winds can occur. This property is also effective when used as construction flooring or as concrete formwork. Plywood's laminated structure distributes loads from impact over a larger area on the opposite face, which effectively reduces the tensile stress. The cross laminated construction of plywood ensures that plywood sheets remain relatively stable under changes of temperature and moisture. This is especially important in flooring and formwork construction where moisture exposure is very likely. With high strength and stiffness to weight ratios, plywood is very cost effective to use in structural applications such as flooring, shearwalls, formwork and webbed beams. The panel shear of plywood is nearly double that of solid timber due its cross laminated structure. This makes plywood a highly effective material to use in gussets for portal frames, webs of fabricated beams and as bracing panels. Plywood does not corrode and can be used in chemical works and cooling towers as a cost-effective, durable material when preservative treated. Whether manufactured from solid or engineered timber, there are many stylish and practical options that won't compromise on strength and structural performance. A distinctive timber door can also create visual impact, adding value to any commercial or domestic building. Timber makes an attractive choice for door design and construction, offering a strength, flexibility and versatility that other materials find hard to match. Protected from moisture, a timber door will perform satisfactorily for the life of any building. With regular maintenance, carefully designed and finished timber doors can perform in the toughest external environment and if required, can be refurbished or updated easily and effectively. This application guide outlines the common elements involved in specifying and finishing timber internal and external doors. Timber portal frames are one of the most favoured structural applications for commercial and industrial buildings whose functions necessitate long spans and open interiors. As a material choice, timber offers designers simplicity, speed and economy in fabrication and erection. Timber portal frames offer a strong, sound and superior structure. Structural action is achieved through rigid connections between column and rafter at the knees, and between the individual rafter members at the ridge. These rigid joints are generally constructed using nailed plywood gussets and on occasion, with steel gussets. From material selection to finishing, this application guide provides a comprehensive overview of the process of using timber in the specification, fabrication and erection of portal frame structures. The versatility, beauty and strength of timber makes it the ideal material choice for interior handrails and balustrades. Treated softwood and durable hardwoods are the most popular timber choices and these can be turned to create a range of unique styles and designs to suit a variety of tastes and decors. When used internally balustrades and handrails are typically finished with a clear lacquer to showcase the natural beauty of the timber and with appropriate care and attention will last a lifetime. Find here general information on member sizes, connections and suitable materials, as well as important considerations, for the specification and construction of interior handrails and balustrades. Framed timber buildings, of post and beam or stud and joist construction, resist lateral loads (wind, earthquake or impact) by using rigid frames (portals), braced frames (trusses and cross-bracing) or structural sheathing elements (diaphragms). Diaphragms are an efficient structural solution to resist lateral forces. The sheeting materials that are generally used as lining or cladding can usually be upgraded to resist shear loads, easily and economically. The framing then performs dual functions, resisting both horizontal and vertical loads. In cases where diaphragms comprise structural sheathing, additional design efficiencies can be incorporated to resist loads normal to walls, floor and roofs using the composite stressed skin action developed between the sheathing and the timber frame. 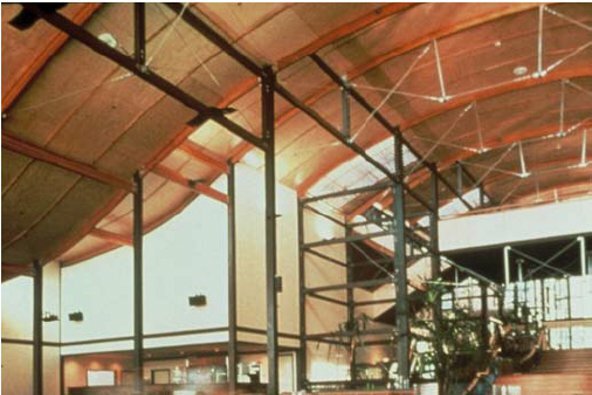 In this section you'll find information about the design and construction details of timber framed diaphragms (both horizontal and vertical) used in domestic, low rise commercial and industrial buildings. Framing design for dead loads, or dead and live loads acting normal to the framing are covered in AS 1720.1 Timber Structures and AS 1684 Residential timber-framed construction. To develop efficient diaphragm action, some adjustments, particularly connection details, are usually required. Information about diaphragm materials and systems is included, however the majority of the design and construction details provided herein are for structural plywood diaphragms for which documented design information is available. All exterior stairs serve a functional purpose, but the choice of timber in the application will turn a functional building element into an aesthetically pleasing feature. And while the construction of stairs is demanding, the investment of time will be returned, with a well constructed timber staircase typically lasting decades. Exterior stairs are usually built from treated softwood and durable hardwoods and typically finished with paint. The construction procedure described here applies to most general type stairs of either conventional or contemporary construction. When it comes to stairs there is a multitude of variations available for application depending on the structural requirements of the building. This guide discusses the most commonly specified stair types. Interior staircase work is considered a specialised area of carpentry and joinery as its construction requires high levels of workmanship, detail and accuracy. Many interior stairs are built from quality joinery timber, cut and seasoned especially for staircases. Interior stairs differ considerably in design, from simple straight flights, commonly used in domestic work, to more elaborate stairs, constructed purposely as stand out features in public and commercial buildings. The construction procedure described here applies to most general type stairs of either conventional or contemporary construction.